God wants you to accept and love yourself as He does. This simple and inspiring book provides you with the spiritual truths that will help you love yourself God’s way. · Learn biblical truths that will help you overcome the lies that lead to self-hate and undermine your self-worth. · Find practical ways that you can do when your love tank is running empty, when you’re feeling needy and need to take care of your self. · Discover valuable lessons that will help you love yourself in a healthy way. PLUS: 52 Ways to Love Yourself, one for every week of the year! Are you ready to take the first step towards wholeness? 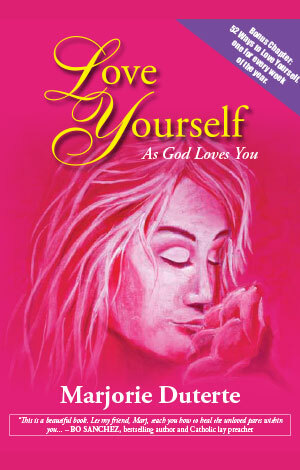 This book will help you to truly love your self, the way God does. I saw piles of Marjorie Duterte’s Love Yourself book as we entered the hallway of the Philippine International Convention Center (PICC) to attend The Feast Bay Area and to support her book launch. After The Feast, the line of people wanting to have their book signed by Marj was like a snake crawling way past the exit of the hall. My daughter demanded that I buy the book immediately before it runs out. I leisurely took my time stopping by the restroom first, confident that there will be a book for me because, well, Marj is my friend. As I approached the bookstand, I was surprised that there were no more books on the table! I heard the staff say, “Grabe, ubos na ang books!” Panic started to set in. I knew the book will be a bestseller, but I didn’t expect it to be sold out on the day it will be launched! Marj is an outstanding yet shy writer. She doesn’t have regular exposure with crowds or a weekly engagement during prayer meetings like The Feast preachers. How come her Love Yourself book was sold out during its launch? Because it’s a book whose time has come. It’s time for us to look within, not without. Not through selfies which seek external validation of our worth. Marj speaks from her heart. Through the book Love Yourself, she takes us through her own journey from painful, dark corners, to enlightened, nurturing spaces full of love. She also takes our hand and guides us how to travel from darkness to light through her practical weekly tips on loving yourself. If you, or someone you love, are searching for an easy to read yet substantial book on self-care, this is the book for you.